First things first – you definitely want a personal trainer who is certified. I’m sure I’m not alone when I say this. There are so many freelancer personal trainers out there masquerading to the real deal. I wouldn’t want to put my health at risk by training with them. I am with you on this one – I know you want someone who knows what he is doing and he must be doing things right. There are so many personal trainer accreditation in the industry today. Some are local while others are overseas. Honestly, it really doesn’t matter as each certification would have its own core curriculum and stringent set of examinations of assessing each trainer’s suitability before graduation. In the first tip, I mentioned that personal trainers in Singapore are aplenty. That’s true. But do you know that a huge portion of personal trainers locally operate as freelancers? In other words, they are a one-man operation. If things go smoothly, I’m happy for you. Yet for some strange reasons (they call it Murphy’s Law – anything that can go wrong will go wrong) if something goes astray, what should you do? You want to protect your rights as a consumer. In short, I’m advising you to minimize your risk level. Why worry about such things when your only focus should be to work towards attaining that body you’ve always wanted? If you are still thinking of hiring a freelance personal trainer in Singapore, stop. Instead, you should only source for a personal trainer from a reputable personal training company established in Singapore. 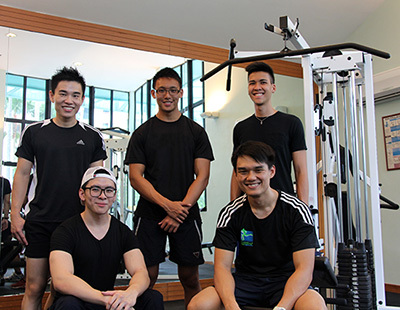 Check out the company website, the trainer’s profile and the personal trainer Singapore rates before you commit. This brings us to Tip #3. There are supermodel look-alike personal trainers and there are also plain Jane personal trainers. Of course, getting a hunky or charming personal trainer certainly will not hurt. But if I were you, I would only hire a personal trainer who has his own transformative story. Imagine if I were skinny and I need a personal trainer to help me build muscles, I would look for someone who has been there and done that. The personal trainer must have walked the same journey as me so he understands my concerns. I call this the first-hand experience. The then-skinny, now bulked-up personal trainer will be able to relate better to me and help me achieve my fitness goal in the same manner as he did. And that’s what makes our team of personal trainers special. They stand out from the rest because at www.PersonalTrainingSingapore.com, our team comprises only of people who have walked the talk. We don’t hire supermodels. We comprise ordinary guy-next-door types who have either been skinny or fat in the past. If we can transform ourselves, we can similarly work with you to help you achieve your fitness goals. Everyone claims he is the best in town. But are they are really the real deal? I would want to hire a personal trainer who has a proven track record. If I am overweight, I would like someone who has helped other clients lose weight and get in shape. Talk is cheap. Ask the personal trainer to show you successful transformations of past clients. If he cannot convince you enough, then I think you should source for another one. Yes, your personal trainer must make exercise fun and not feel like a chore. After all, life is already full of challenges, isn’t it? In fact, the personal trainer must aim to make fitness a part of your lifestyle. By periodically changing the exercise routines (so as to prevent boredom and muscle complacency), you will always be learning, growing and living healthily. Do ask about this during the fitness consultation and before you commence any exercise programme. Gently ask what sort of fitness programme you will undergo and how often will the routine be changed. As the saying goes, variety is the spice of life. Different personal trainers charge different rates based on their experience and education. It all depends on how much you are willing to spend on hiring one. In my opinion, you wouldn’t want to pay $20 to hire a personal trainer (although you certainly can). I’m not sure about the quality of the fitness programmes he designs though. On the other end, I’m not going to spend $200 on a trainer as well. You could too if you want to hire a celebrity fitness trainer as that’s the type of fees they command per hour. In retrospect, personal trainers are also human beings and they trade their time for a decent income. So it’s fair to pay them a fair rate.